PALMDALE – The Los Angeles County Sheriff’s Department will be working with the Special Olympics to present “Tip-A-Cop” this Saturday, October 12. The event will be held from 11 a.m. to 8 p.m. at the Red Robin Restaurant in the Antelope Valley Mall. “Tip-A-Cop” is an official Law Enforcement Torch Run Campaign fundraising event. Law enforcement officers and department personnel volunteer their time as “Celebrity Waiters” to collect tips at Red Robin Restaurants to support Special Olympics of Southern California. All tips are tax deductible. Proceeds raised from this event go to the Antelope Valley chapter of Special Olympics Southern California (SOSC). SOSC provides year-round sports training and competition for children and adults with intellectual disabilities. By participating in sports, physical fitness and healthcare education programs, Special Olympics athletes increase self-confidence and social skills, improve physical and motor skills, and have better success in leading more productive and independent lives. For more information, visit www.sosc.org. 4 comments for "Tip a Cop this Saturday, support Special Olympics"
While this is an admirable idea, I strongly feel more people would Tip-A-Firefighter or Paramedic. No offense to the Sheriffs and their line of work, but public opinion of the other 2 always fair better. Hopefully there is a good turn out. I’ll be there. It’s not about the cops or how people think of them. It’s a fundraiser for the special Olympics. Each department (meaning firefighters and ems) have their own fundraisers throughout the year. This is just something the sheriffs do every year. 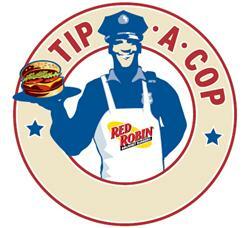 If people don’t want to go to red robin simply because they hate cops…they aren’t hurting the cops, they are hurting the people who benefit from the fundraiser. I will definitely be at the red robin fundraiser. It’s for a great cause and it would be nice for others in the community to want to help others as well (not directing that towards u). The resident of Palmdale and Lancaster have become more about helping themselves than helping each other. I second that…and might I just say..
Can’t we all just get along..NO PUN INTENDED.. Think what we could do if we all, “leaders included” pulled together instead of apart…. This valley could be so much better in so many ways, just saying!